A painting by Swedish artist Emil Österman depicting the founder of the Nobel Prize, Alfred Nobel. Alfred Nobel was an inventor, entrepreneur, scientist and businessman who also wrote poetry and drama. His varied interests are reflected in the prize he established. and which he lay the foundation for in 1895 when he wrote his last will, leaving much of his wealth to the establishment of the prize. Since 1901, the Nobel Prize has been honoring men and women from around the world for outstanding achievements in physics, chemistry, physiology or medicine, literature, and for work in peace. Find out more about Alfred’s life. The will of Alfred Nobel. Alfred Nobel is born in Stockholm, Sweden. In the same year, his father, Immanuel Nobel, goes bankrupt. Immanuel Nobel arrives in St Petersburg, Russia, where he starts a mechanical workshop; he leaves his family behind in Sweden. He lands a contract with a Russian general, who is interested in the Swedish inventor’s designs for sea and land mines. His business flourishes and evolves to a large mechanical engineering company. The Nobel family is reunited in St Petersburg, Russia. At the age of 17, Alfred Nobel speaks five languages fluently. He travels to Paris and works for one year in the laboratory of T. Jules Pelouze. He also travels to Italy, Germany and the United States (US). Immanuel Nobel’s company goes bankrupt as the Crimean War ends and the Russian military cancel orders. Alfred Nobel searches desperately for new products. Nikolai N. Zinin, Nobel’s chemistry teacher, reminds him of nitroglycerin. Alfred Nobel starts his experiments with nitroglycerin. Alfred Nobel moves back to Stockholm and obtains the first patent on nitroglycerin (blasting oil) as an industrial explosive. Alfred Nobel patents a detonator (blasting cap) for triggering the explosion of nitroglycerin and forms the company Nitroglycerin AB. Emil, Alfred Nobel’s brother, is killed during the preparation of nitroglycerin at Heleneborg, Stockholm. Alfred Nobel improves the blasting cap design and moves to Germany to set up the Alfred Nobel & Co Factory in Krümmel near Hamburg. A violent explosion destroys the Krümmel plant in Germay. Experimenting on a raft anchored on the river Elbe, Alfred Nobel tries to make nitroglycerin safer to handle. He finds that nitroglycerin is stabilized by the addition of kieselguhr (a siliceous deposit; also known as diatomaceous earth), and calls this mixture dynamite. (From greek dynamis meaning ”power”). He also establishes the United States Blasting Oil Company in the US. Alfred Nobel obtains a patent for dynamite in Sweden. Alfred Nobel establishes the British Dynamite Company (Ardeer, Scotland, UK). In 1877 the company name is changed to Nobel’s Explosives Company. Immanuel, Alfred Nobel’s father, passes away. At the age of 40 Alfred Nobel is a wealthy man. He moves to Paris and settles at Avenue Malakoff. The manufacture of nitroglycerin and dynamite starts at Ardeer, Scotland, UK. Alfred Nobel invents blasting gelatine in Paris and establishes Société Générale pour la Fabrication de la Dynamite in Paris. Alfred Nobel obtains a patent on blasting gelatine. Dynamitaktiengesellschaft (DAG), formerly Alfred Nobel & Co (Hamburg, Germany), is formed. Alfred Nobel advertises for a housekeeper/personal secretary, meets with Bertha Kinsky von Chinic und Tettau (later von Suttner) and hires her. She leaves his employment after a short time and becomes a leading peace activist. Dynamite Nobel is formed by merging Nobel’s Italian and Swiss companies. Alfred Nobel buys an estate and laboratory at Sevran outside Paris. German Union is formed by merging Dynamitaktiengesellschaft (DAG) and a group of German dynamite companies. 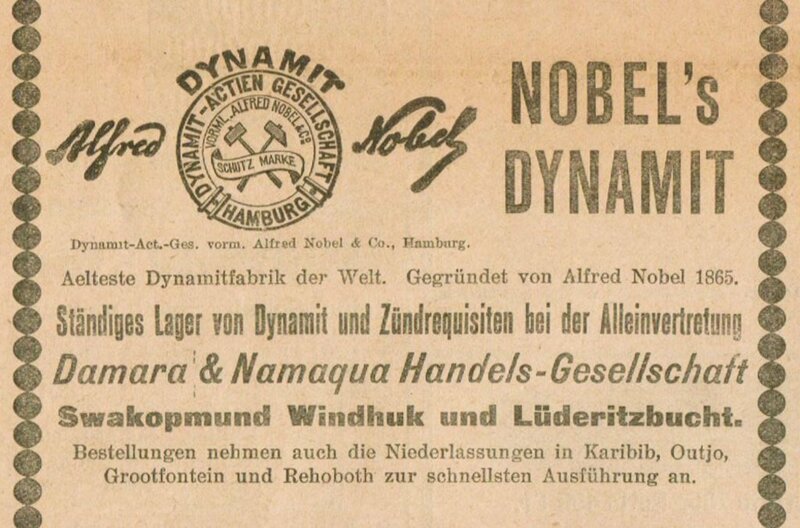 Nobel-Dynamite Trust Co (London, UK) is formed by merging Dynamitaktiengesellschaft (DAG) and the Nobel’s Explosives Company. Nobel obtains a patent for the blasting powder “ballistite” in France. Andriette, Alfred Nobel’s mother, passes away. Alfred Nobel leaves Paris and settles in San Remo, Italy, after a dispute with the French government over ballistite. Alfred Nobel hires the young engineer Ragnar Sohlman, who he later names executor of his will and testament. Alfred Nobel buys a small machine works (Bofors-Gullspång) and a manor (Björkborn) at Karlskoga, Sweden. 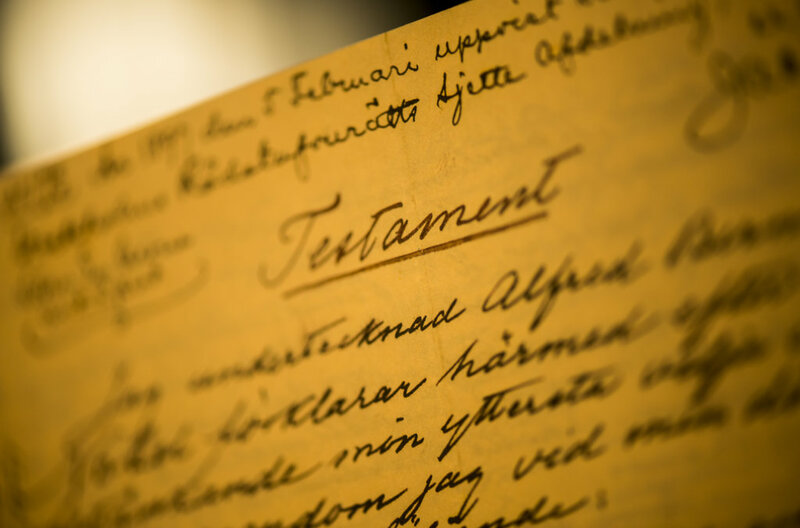 The third and final will of Alfred Nobel is signed at the Swedish-Norwegian Club in Paris. Alfred Nobel dies, at the age of 63, in his home in San Remo, Italy, on 10 December 1896. The first Nobel Prizes are awarded on 10 December. Based on Alfred’s work and patents a whole new industry developed. Within ten years, 16 explosives producing factories had been founded in 14 countries with Nobel as shareholder or co-owner. Alfred Nobel also had a big interest in literature and writing. He left behind a private library at Björkborn with over 1,500 volumes, among those works by many great writers of the 19th century. 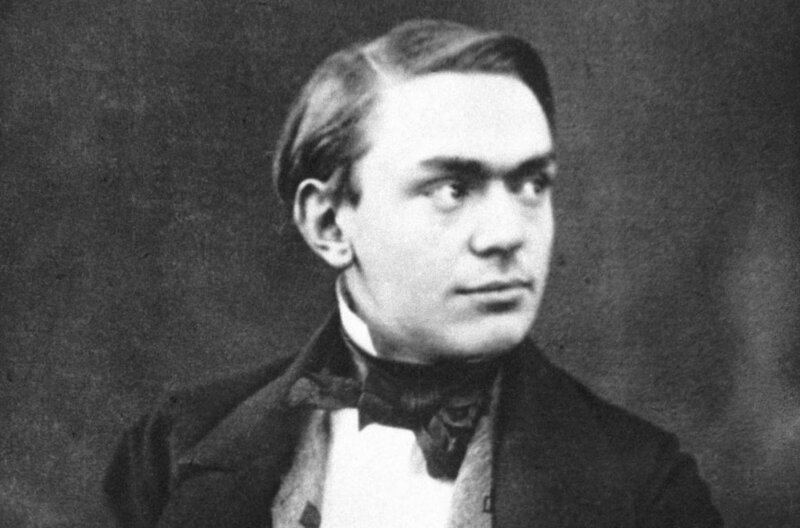 A young Alfred Nobel, 1853. Photo: Provided by Nobel Foundation. Alfred invented dynamite and experimented in making synthetic rubber, leather and artificial silk among many other things. During his lifetime he acquired 355 patents worldwide. 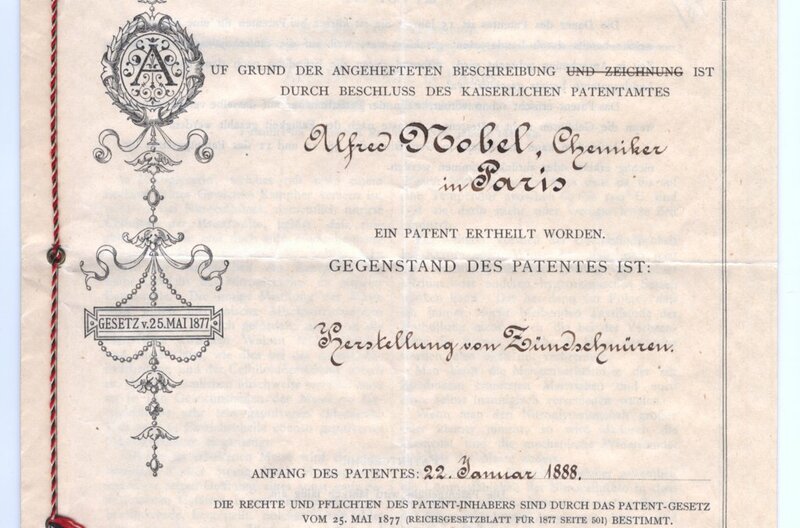 A German patent Alfred Nobel acquired.